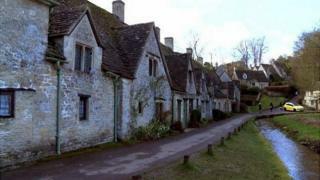 An "ugly" yellow car parked in a picturesque Cotswold village is being blamed for ruining hundreds of tourists' snaps. A shot of the Vauxhall Corsa parked in Bibury was posted by Lee McCallum with the comment: "Picture postcard street photobombed by ugly little yellow car." Since then, numerous visitors have taken to Twitter claiming it "ruins" the view and is a "shot spoiler". But Mr McCallum insists the car is "so out of place - you've got to love it". The 17th Century cottages of Arlington Row are featured on the inside cover of the British passport and are some of the most photographed dwellings in the country. "I take hundreds of people there each year and the yellow car is always there," said tour operator Mr McCallum. "I tell them beforehand that they're going to see an ugly little yellow car in the beautiful setting of Arlington Row and nobody's complained about it. "But it's so out of place and in such stark contrast to the scenery - you've just got to celebrate it." The former weavers' cottages are owned by the National Trust, but Allan King, from the trust, said it had no control over what colour cars residents are allowed. "The car is parked outside one of our neighbouring properties, he's not one of our tenants," Mr King said. "For tenants of our properties, we have a car park behind Arlington Row but it's up to them if they want to park outside their houses - they live there." Image caption One tour operator said the car is "always there"